Readers gave their definitions of love in six or fewer words influenced by a legend that Ernest Hemingway once boasted that he could write a complete story in just six words. The legend, which has never been proved, provoked this article that I read to apply this theory to LOVE. Here are some of the responses I wanted to share. We are blessed and surrounded by love and goodness aren't we? I love great quotes! It was so fun seeing you all yesterday - your girls are just sooo sweet! We had so much fun celebrating with Meade boy! "The best thing about me is you!" I mean, for reals? 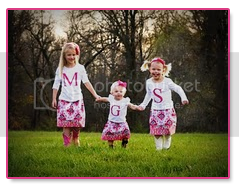 Could your girls get any cuter!? Love those VDay tops and espesh Soph's leggings! !